To learn how to cook the authentic dishes of Argentina, visit “Tierra Negra” the home of your wonderful hosts Veronica and Manuel, a sommelier and chef respectively. 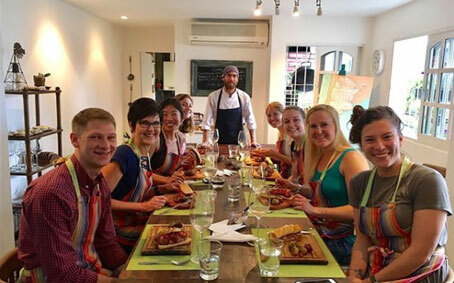 Located in the chic Palermo neighborhood of Buenos Aires, it’s a delightful place to discover Argentine culture through a hands-on cooking class and learn dishes that you can recreate back home; a wonderful way to share your travel experiences with friends. Veronica and Manuel offer you the ‘Street Food’ class. It’s an introduction to typical Argentine street food instead. After this particular class you can show your friends and family why “choripan” is the comfort food of taxi drivers all over Buenos Aires. Typically, it’s a sausage made out of beef and pork, hot off the grill, split down the middle, and served on a roll, preferably with a delicious chimichurri sauce, but Manuel might apply his own twist. Then you’ll learn how to make spicy Andean potatoes and traditional biscuit sandwiches filled with dulce de leche and side-coated with shredded coconut. You will try 2 organic wines from different regions of Argentine. CHORIPAN WITH CHIMICHURRI AND SALSA CRIOLLA: pan de campo (homemade bread) + Chorizo, your choice of pork, lamb, chicken or veggie + 2 different sauces. PAPAS ANDINAS PICANTES: from the North of Argentina, “spicy Andean potatoes”. 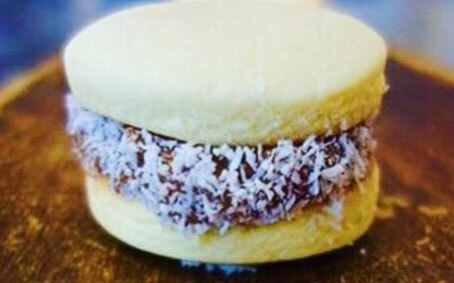 ALFAJORES DE MAICENA: traditional sandwich biscuits filled with Dulce de Leche and side-coated with shredded coconut. MATE: you’ll learn about the history of yerba mate, its origins and how to prepare this traditional drink from scratch in individual mate cups. WINE: you’ll taste 2 organic wines from different regions of the county.